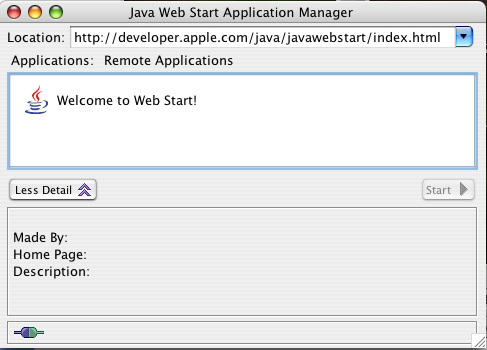 After installing Java Web Start you should have a Java Web Start Icon on your desktop (WINDOWS), a Java Web Start Application in the Application/Utilities/Java folder (MAC OSX). Start the Java Web Start application. Choose http://developer.apple.com/java/javawebstart/index.html as location from the drop down menu. Now select Welcome to Web Start and click on Start. 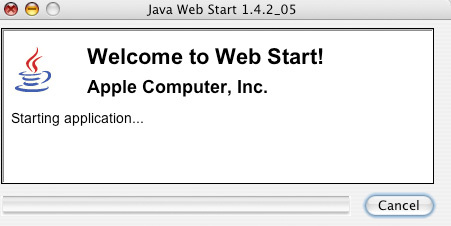 At this point the java web start download dialog is displayed and then the application itself starts. In this preference panel one can enable java web start logging under the advanced tab. Log messages can be written to a console window and/or to a file. Too enable logging check any of the output options. To clear your current cache simply click on Delete Files in the Network Tab. When starting a java web start application java web start by default will ask to keep the link on the desktop when launching an application a second time. Through the preference panel this default behavior can be changed.